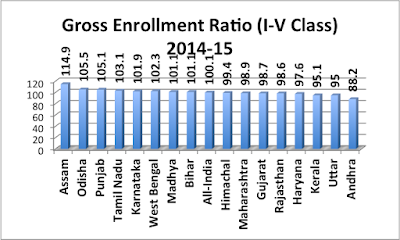 The inter-state comparison of 16 selected states in the latest “Economic Survey 2015-16”, released by the Government of India last week, has demonstrated that Gujarat has behind most of the Indian states in enrolling children to its schools, despite its much-publicized annual campaign in which the entire bureaucracy participates under the leadership of the chief minister. 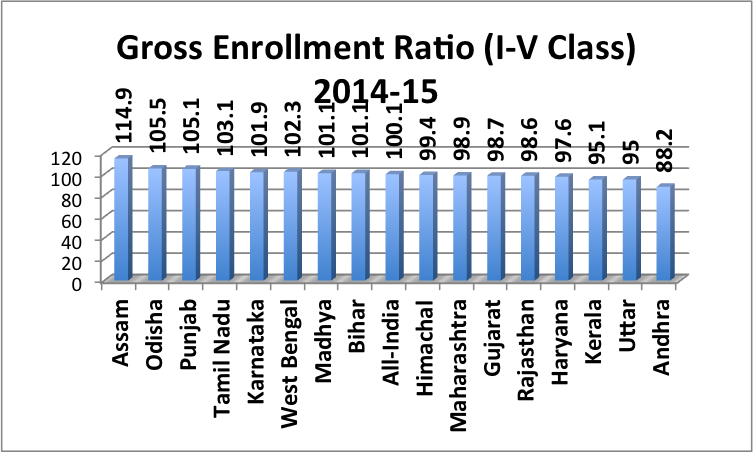 Providing official figures for the year 2014-15, the survey has found that, at the primary level (classes I to V), Gujarat is behind 10 other states, ranking No 11 in Gross Enrollment Ratio (GER). 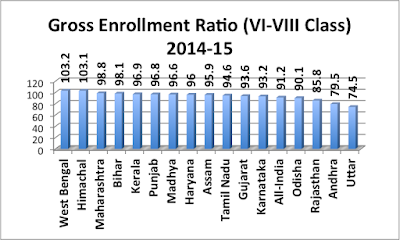 At the middle level (classes VI to VIII) it is, again, behind 10 other states, ranking No 11, and at the secondary level (classes IX-X), it is behind 12 other states, ranking No 13th. 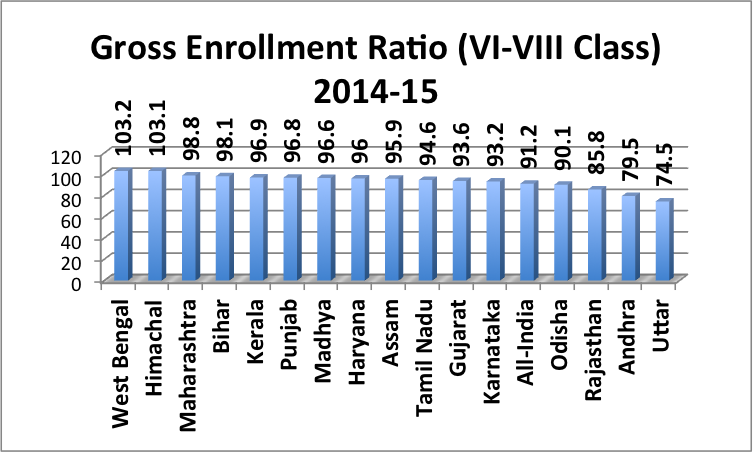 The figures suggest, while at the primary level in Gujarat, just about 2.3 per cent of the children did not get themselves enrolled, things begin to worsen at the higher level. At the middle level, the percentage reaches 6.4 per cent, and at the secondary level it reaches a whopping 25.7 per cent. The Government of India figures bely the claim of the Gujarat government of 100 per cent enrollment during the Shala Praveshotsav annual enrollment drive, which continues for three days every year. All bureaucrats are made to visit remotest parts of Gujarat to ensure every child is enrolled. The World Bank defines GER to include students whose age exceeds the official age group (e.g. repeaters), adding, as against this, the “net” enrollment of school children includes only children of the official school age, as defined by the national education system. “Thus, if there is late enrollment, early enrollment, or repetition, the total enrollment can exceed the population of the age group that officially corresponds to the level of education – leading to ratios greater than 100 percent”, it says. The Economic Survey report figures are not very different from those released earlier. 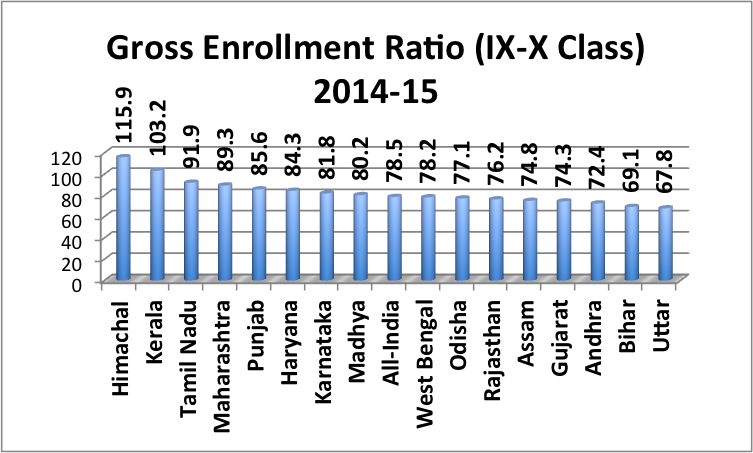 A recent report, based on data provided by the Census of India, had estimated that 14.93 lakh children in the age group of 6-18 years from Gujarat never attended school in 2010-11. The figures show that around 9.63 per cent children between 6 and 18 years have never attended school. Gujarat has 1.55 crore children and youths in this age group. In India, of 33.33 crore children and youths in this age group, 4.4 crore have never been to school which comes to 13.20 per cent of the population in this age group. Earlier, the National Sample Survey Organization (NSSO) report, “Key Indicators of Social Consumption in India: Education”, that Gujarat has a far fewer percentage of rural girls in the age group 14-17 going to school than any of the 21 major states of India. The NSS, which carried out its survey between January and June 2014, said Gujarat’s just about 52 per cent rural girls attend school in the age group 14-17, as against the national average of 72 per cent. 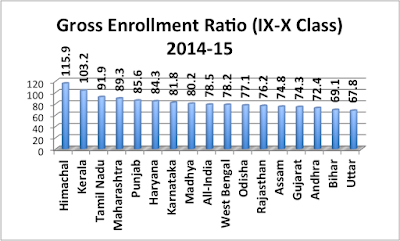 The data further show that, while Kerala and Himachal Pradesh top in sending their rural girls to school with 96 and 95 per cent, even poorer states are far ahead: Assam 78 per cent, Jharkhand 72 per cent, Bihar 69 per cent, UP 68 per cent, Madhya Pradesh 67 per cent, Odisha 63 per cent, and Rajasthan 59 per cent.